Tonight the crop at Personal Scrapper will come to an official close at midnight. I had my August kit out on my table and decided to scrap with it until it was gone. Keep in mind, before the kit arrived, I had already purchased most of the patterned papers from the Scenic Route Garden Grove line that was in the kit. Plus, I pulled extra cardstock and some embellishments from my stash. For "my dad...my coach" I used a sketch from Got Sketch. 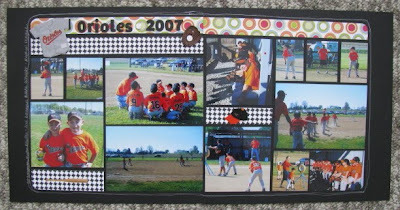 I loved the American Crafts foam shapes that came with the kit, but I didn't have any travel pics to scrap. 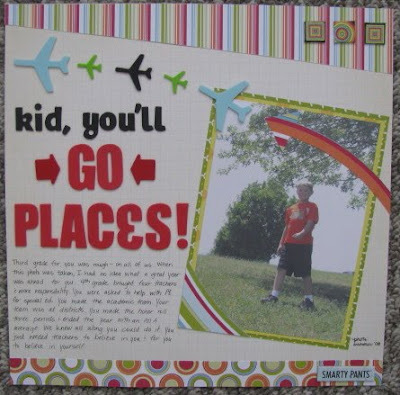 I tried to get creative so I could use them and came up with "kid, you'll go places!" 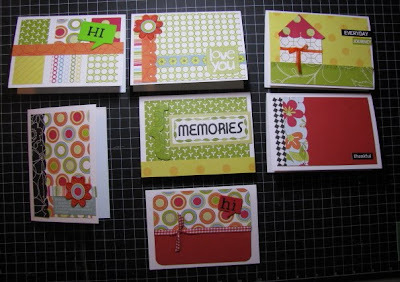 Finally, I took my scraps and just got busy making cards. I am surprisingly happy with them. I don't consider myself a cardmaker and usually stress over making them. It was fun to make them by piecing my scraps together though. I'll have to do that more often! Now that my August kit is gone, I'm looking forward to receiving my September kit! Love the kid you'll go places LO. I was having a hard time figuring out what to do with all of those planes. I may lift your LO and do that. 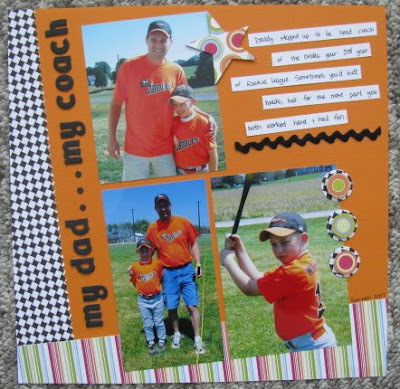 Beautiful as usual Amy...I love the angle of you layout on my dad my coach...very nice. Love the layouts AND the cards. Using up scraps for cards it the best!